Tailblock may not be easy to categorise, but they are certainly easy to like. Offering a sound that will undeniably ignite your aural senses, this hearty trio are poised to break out this year. 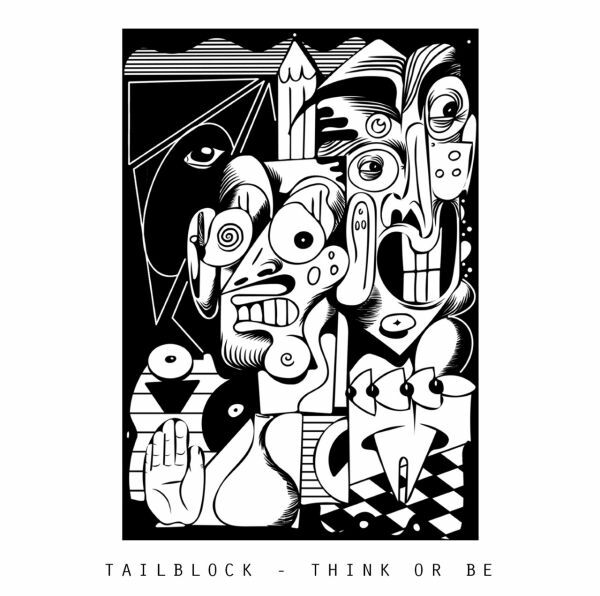 Tailblock release their sophomore EP, Think Or Be, on Friday 13th July, and in anticipation, the tune merchants have just dropped a new track, “Heavy Arms”, which you can check out at the bottom of this article. Tailblock have now completed work on their new EP, Think Or Be. Again, with Ian Sadler at the helm, this new release is a cut above their debut record. Expressing a cluster of earnest and driving tracks, the EP gleams from the speakers with its enticing rhythms and colossal refrains. With UK dates and European shows in the pipeline, the remainder of 2018 will surely be a busy one for this emerging trio. This song is all about the choice between thinking far too much about all the possible outcomes of a situation, instead of just going with it, enjoying the moment you’re in, and going with the flow. It’s also about things changing for the better, even if it doesn’t seem like it at first. “Heavy Arms” is about trying to remain positive, and not giving up when you start to doubt yourself. It’s about wanting to feel like you’re worth something, and prove it to yourself more than anyone else. The final verse is about wishing that certain people realise just how easy they have it, and that if they had to go it alone they would be pretty much useless. Having your time wasted is rubbish, getting to spend it with the people that you love, doing whatever you enjoy doing, and generally having a good time is way better. It’s about doing the things you want to do, making decisions for yourself, and not caring about meeting the expectations of anyone. Before me and my wife were married, or even seeing each other, I walked her home from the pub, I asked for her phone number, so I could ask her out sometime. She told me she didn’t have a phone so I just said I’d just see her when I see her… Years later, she told me that she did have a phone but just didn’t want to risk me phoning her up as she hated talking on the phone. “Listen” is about people being false, pretending they like people, just getting along for the sake of things. People sometimes act a certain way just for the benefit of one person, not realising the the other person is doing the same thing. You can tell someone repeatedly what another person is really like, that they’re not how they seem, but everyone has to find out for themselves. Everybody wants to be good at something, but it’s not always easy to stay motivated. Sometimes it’s difficult to stay motivated, so set your expectations low, and just remember that even the very best people out there doubt themselves. The song is about trying to support those around you when they’re feeling low.